One Sunday of every month, and after the sermon, two ministers from my church, stand in front of a decorative wooden table, and instruct the congregation to receive the elements, in remembrance of Christ’s death upon the cross. But what to call this ceremony remains a subject of some debate. 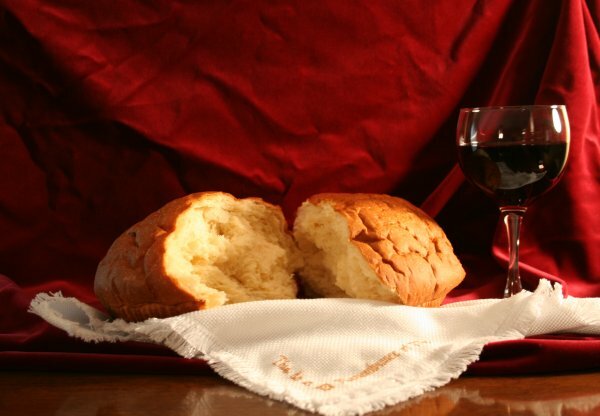 Many Christians still speak of “the breaking of (the) bread” to express what goes on at that table, though by association, it also includes the partaking of wine, or grape juice, as is done in my church.1 A long standing debate in the church at large, over what this means, invites rigorous discussion among believers. Does the bread and wine/juice merely symbolize the presence of Christ, as a memorial, or do they somehow point to a real, even physical(?? 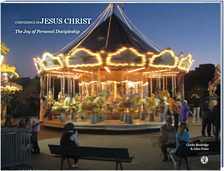 ), presence of the Lord Jesus, at that very moment? We have explored some of the details of this controversy some time ago on Veracity. But for the moment, I have a simpler question: What do we call the whole thing, with the bread and the wine or juice, to begin with? Nevertheless, a number of terms have arisen since then to describe the sacred meal, not just “eucharist.” So, what is the best terminology? Eucharist? The Divine Liturgy? The Blessed Sacrament? The Mass? What else? Thomas Cranmer, 16th century Archbishop of Canterbury, who helped give English-speaking Christians the vocabulary to celebrate the last supper, before Christ’s crucifixion. The 16th century English Archbishop, Thomas Cranmer, was stuck with this very problem, when he took up the task to write a “Book of Common Prayer,” a printed order of worship for prescribed use in all church services, for all English citizens, in his day. But 16th century England was in theological turmoil. Cranmer was in the unenviable situation of trying to forge a middle way between Catholic transubstantiationalists, on one side, and more radically oriented memorialists, on the Protestant Reformed other side. Thomas Cranmer’s personal view on “the breaking of the bread” can be difficult to pin down, as his perspective evolved over time. Cranmer had, at one point, become more Lutheran in orientation, rejecting the traditional concept of transubstantiation, whereby the bread and wine literally become the body and blood of Jesus. Yet Cranmer still somehow affirmed Christ’s physical presence in the elements, as did the most vocal leader of the Reformation, Martin Luther. Scholars continue to debate this, but while Cranmer was becoming more radical in his views on “the breaking of the bread,” he was not becoming too radical. Cranmer came close, but would not completely follow the Swiss Reformer of Zurich, Ulrich Zwingli, who tended to see “the breaking of the bread” as merely a way of reminding us of Christ’s death, devoid of any real encounter with Christ, the memorialist view. Cranmer probably thought Christ could be encountered in a real way in “the breaking of the bread,” as might happen with prayer, or reading the Bible. But Cranmer recoiled at even the very hint of transubstantiation. “Communion” satisfied those in the middle who wanted a more biblical grounding for their faith, that was less encumbered by the unfavorable excesses of ritualism then associated with Rome, while keeping distance from radical Protestants views that would trivialize the taking of the bread and the cup, far too much. 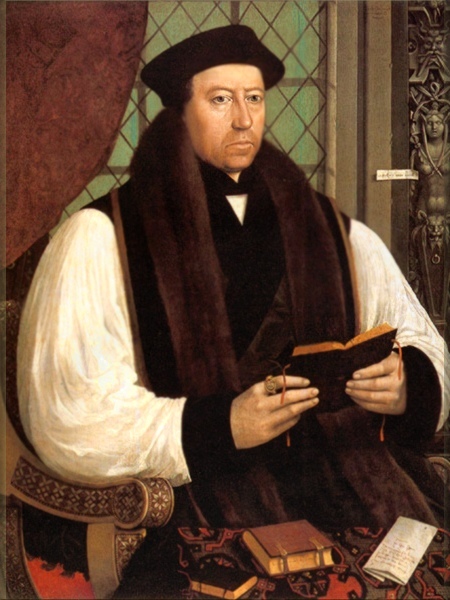 Thomas Cranmer was unable to see the ultimate acceptance of “Communion” win over the Christians of England. Whether he would like it or not, is another story. In the 1549 version, Cranmer had begrudgingly inserted “The Body (and Blood) of our Lord Jesus Christ” prior to “Take and eat (drink) this in remembrance.” He had managed to remove the former phrase in the 1552 version, as keeping it implied a Lutheran view of Christ’s physical presence at communion. But after Cranmer’s death, Queen Elizabeth reinserted the deleted phrase back into the 1559 version of the Book of Common Prayer, reopening the door that Cranmer had hoped to close shut. By 1556, the Catholic Queen Mary, otherwise known as “Bloody Mary,” had been installed upon the throne, and she sought to put an end to Cranmer’s moderate efforts towards Reform. Cranmer was arrested and charged with treason, as Cranmer’s Protestant views were seen to be in direct conflict with Mary’s program of reinstating Roman Catholicism as the official religion of England. Cranmer, at one point, recanted of his Protestant views, and accepted the full authority of the Pope and the Catholic church, even receiving the traditional Mass. Cranmer’s conscience soon got the better of him. He recanted of his recantation, and the once-disgraced Archbishop eventually suffered a martyr’s death. Some look upon Thomas Cranmer as unprincipled, waffling back and forth on matters of vital concern. But such a judgment fails to take into account what he was trying to do, and the almost impossible dilemma he faced. Cranmer was aware of the boundaries on either side of him, but he was committed to forge a solution that would best serve the church in England as a whole. To his credit, the language of “Communion” has resonated throughout the English speaking world for centuries to best represent what happens when Christians partake of the bread and the cup, to remember the death of Christ. In recent times, however, the hegemony enjoyed by the influence of Cranmer’s Book of Common Prayer has waned, particularly as many Anglican and Episcopal churches diminish in terms of cultural influence, relative to the growth of other denominational traditions. The old debates are reemerging, as the church follows the trend in the wider culture to divide and individualize to a heightened degree. The discussion about “Communion” will probably be forever with us. When Jesus said at that last supper, “This is my Body” (Luke 22:19 ESV), Christians will ask themselves, “Is this to be understood literally, or metaphorically, and if so, what does this really mean?” Nevertheless, keeping the discussion going is a good thing, as we contemplate the mystery. This entry was posted on Sunday, May 7th, 2017 at 7:02 pm	and tagged with acts, breaking of the bread, Church History, communion, eucharist, lord's supper, Martin Luther, thomas cranmer, zwingli and posted in Topics. You can follow any responses to this entry through the RSS 2.0 feed. « Should Christians Hold All Things in Common, Like the Early Church Did? Thanks for this, Clarke! Always love reading your blog and especially when you tie in church history. So interesting! Jane. Thanks for commenting. Before researching this, I never knew how controversial the Book of Common Prayer was, when it was first written by Thomas Cranmer. I have been watching the PBS Masterpiece Theatre series, Wolf Hall, on Sunday nights. Wolf Hall is about Thomas Cromwell, Thomas Cranmer’s colleague and King Henry VIII’s right hand man, until Cromwell was executed. A lot of brutal stuff, too, when politics and the church get intertwined.